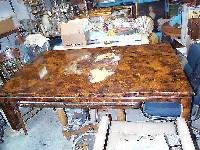 Golberg Restoration Co. - Furniture and wood restoration services. Our furniture & frame, and screen restoration and conservation services are tailored for select items. When it comes to any restoration, including furniture, we believe in quality work, and we are confident that nobody can do a better job than the work we do. Whether structural reinforcement or cosmetic work is done, we do all we can to leave as much of the original stains and finishes intact. After all, a 17 century chest should not look like new. But it should be as strong as it was when it was originally manufactured. That is why we reinforce the objects with inside pins, and try not to destroy original finish. That is why we use custom hand carved details to replace missing elements. That is why we offer different finishes, so we can match the style of your piece. 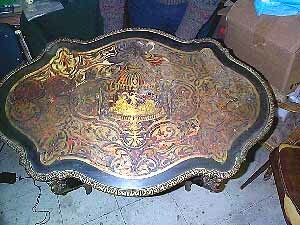 That is why we try to preserve as much of original stains and finish as possible. Custom hand carving to recreate delicate elements. Whole pieces can be created to match existing items in the set. Please note: we do not offer re-upholstery and re-canning services.